People repeatedly jolted awake during the night show immediate increases in amyloid buildup in their brains, a process associated with Alzheimer's. Getting a solid night’s sleep is crucial not only for feeling good the next day – there is increasing evidence that it may also protect against dementia, according to new research presented Tuesday at the Alzheimer’s Association International Conference in London. Three studies by researchers at Wheaton College found significant connections between breathing disorders that interrupt sleep and the accumulation of biomarkers for Alzheimer’s Disease. Treating the problems with dental appliances or CPAP machines that force air into airways could help lower the risk of dementia or slow its progress, the researchers said. People with sleep-disordered breathing experience repeated episodes of hypopnea (under breathing) and apnea (not breathing) during sleep. The most common form, Obstructive Sleep Apnea, occurs in around 3 in 10 men and 1 in 5 women, according to the Alzheimer’s Association. It occurs when the upper airway closes fully or partially while efforts to breathe continue, and it can wake a person up 50 or 60 times a night, interrupting the stages of sleep necessary for a restful night. It often starts in middle age, before clinical signs of Alzheimer’s usually appear. 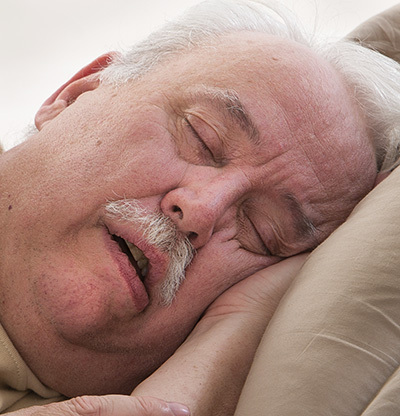 In one study of 516 cognitively normal adults 71 to 78, those with sleep disordered breathing had greater increases in beta-amyloid deposits over a three-year period. This was true regardless of whether they had the ApoeE4 gene considered a risk factor for Alzheimer’s. A second study found that OSA was associated with increases in amyloid buildup in older people with mild cognitive impairment, and a third found such an association in both normal and MCI subjects. While correlation between sleep apnea and dementia has been documented in the past, these are among the first longitudinal studies to look at the relationship between sleep disruption and the biomarkers, such as beta-amyloid accumulation, that are commonly associated with Alzheimer’s Disease, said Megan Hogan, one of the Wheaton researchers. Noting that past research has found that the brain clears up deposits of amyloid plaque during sleep, Hogan hypothesized that apnea may impede this process. “During sleep, when your brain has time to wash away all the toxins that have built up throughout the day, continually interrupting sleep may give it less time to do that,” she said. It may be in the deepest stages of sleep that the clearing up takes place, said Ronald Petersen, director of the Mayo Clinic Alzheimer’s Disease Research Center and the Mayo Clinic Study of Aging. “If you’re only making it to Stage 1 or Stage 2 and then you start choking or snoring or whatever and you wake yourself up and you do it again and again, you may not even be aware of it, but you…may be accumulating this bad amyloid in the brain rather than clearing it,” he said. In recent research, people repeatedly jolted awake during the night showed immediate increases in amyloid buildup and, if the sleep disruption continued for a couple of weeks, subjects also showed increases in the tau protein tangles that are also associated with Alzheimer’s, Petersen said. Repeated deprivation of oxygen to the brain that occurs during apnea may also contribute to amyloid buildup, as oxygen regulates an enzyme that plays a role in creating amyloid, Hogan said. It is not yet clear whether the relationship between apnea and dementia is causative – “whether people with very early levels of brain disease are having trouble sleeping or whether people having trouble sleeping are more likely to develop brain disease,” said Keith Fargo, director of scientific programs & outreach at the Alzheimer’s Association. He noted that animal studies have shown it could go both ways. A next step in confirming that sleep disruption causes amyloid buildup could be to conduct an intervention with CPAP machines and see if their use reduces the incidence of amyloid buildup, Hogan and Fargo said.